Finding the Knoxville financial planner or financial advisor that’s right for you can be a challenge. We believe it is important that you find someone with a consistent, disciplined investment philosophy and process. We believe investment management is more science than art. Nobody has a crystal ball, so we use history, economic theory, statistics, and cognitive psychology to build well-diversified portfolios that maximize the probability of a successful outcome. Our business is to help you start, grow, and manage your personal wealth. Understand Clients’ Needs We start by listening to your needs, past experiences, and future goals. Establish Parameters We work with you to determine your investment objectives, risk tolerance, and any constraints that might impact your investment portfolio. Develop Strategy Based on the information we have gathered, we develop a strategy to give you continuous and focused investment advice and/or to make investments on your behalf. 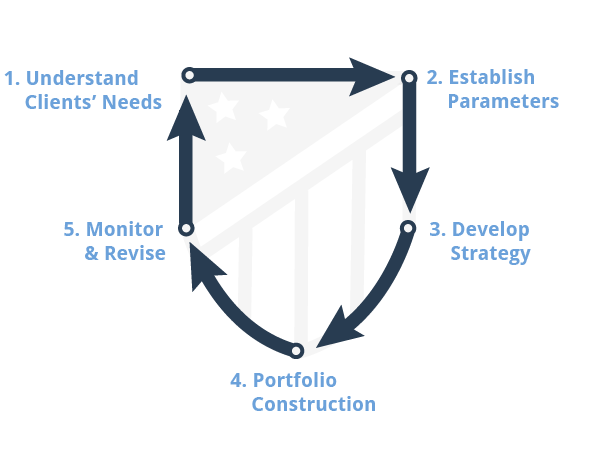 Portfolio Construction We construct a portfolio that is consistent with your goals and desired outcomes, based on our capital market assumptions, statistical analysis, and qualitative study. Monitor & Revise Once we construct your investment portfolio, we monitor the portfolio’s performance on an ongoing basis and rebalance as required by changes in market conditions and in your financial circumstances. Whether you’re looking for a Knoxville financial planner, financial advisor, or someone to help you manage your wealth, we offer an array of services to help you achieve your goals. Our team is skilled in constructing investment portfolios that are tailored to your specific needs, investment objectives, and risk tolerence.